· A 14 karat gold Mask of Power! · A day with skateboarding superstar Andy Macdonald! · Andy Macdonald Prize Package! terms on your entry form. Then send it in for your chance to win! 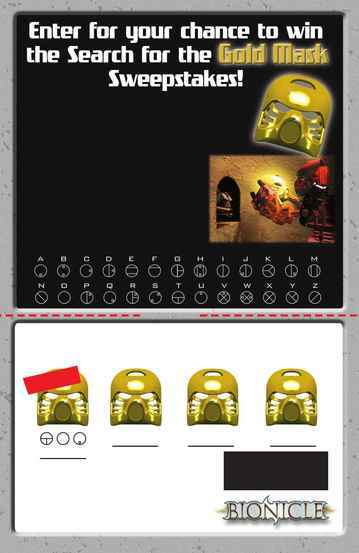 · LEGO Mania Magazine · Online at www.bionicle.com · Select places visited by the LEGO BIONICLE "Find the Power" Tour this summer. PO Box 4423, Blair, NE 68009-4423. Entry forms must be received by Oct. 8, 2001. See complete official rules on back. LEGO, the LEGO logo and Bionicle are trademarks of the LEGO Group. © 2001 The LEGO Group.